Scotland coach Andy Robinson was left fuming after Ireland clung onto a 21-18 lead to win a closely fought fixture at Murrayfield this weekend. Despite coming close, Scotland have now lost three from three in this year's Championship. In a game littered with penalties, Robinson was left scratching his head as to why more was not done about the persistent infringing; highlighting the 13-4 penalty count against his side, and the sin-binning of prop Allan Jacobsen as key to his team's defeat. Three tries for the Irish, coming from Jamie Heaslip, Eoin Reddan and Ronan O'Gara, who also added three conversions, was enough to grant the visitors a win, although the performance was far from convincing. Scotland responded with four Chris Paterson penalties, a Dan Parks drop goal and penalty, yet could not find the cutting edge to breach a resolute Irish defence. Despite a strong last quarter, the Scot’s were held out at 21-18, and are yet to register a win in this year’s Six Nations. They now have to travel to Grand Slam-chasing England on March 13. After the game, a pleased Ireland head coach Declan Kidney said: "It's encouraging when we are scoring tries - three in this game, three in the last game (against France), that is always positive. "It is a difficult place to come and win. We got three tries and we let a couple of others slip away. But we won the match. The way the things are in the country, why not celebrate that? Hopefully people will have a good night." Scotland coach Robinson pointed the finger at referee Nigel Owens as the reason to his side’s defeat. "There are a number of issues that I have about the game; firstly, the high Irish penalty count and no sin-bins and their ability to slow our ball down illegally. "Secondly, I thought the scrums just after half-time - when we've got the Irish going backwards and there was a penalty against us and then from the next scrum our prop (Jacobsen) was sin-binned - was a major turning point in the game. "We were just about to get on top of the Irish and to lose a player like that is pretty hard to come back from. I want to know why he made those calls," he added. England are looking on course for their first Grand Slam since 2003 as they won a hard-fought battle against champions France 17-9 at Twickenham on Saturday, making it three out of three wins so far in this year’s Six Nations. While at times England looked scrappy in the backs with inaccurate passing and a few dropped balls, they managed to keep things together to hold off the French challenge, with a try to Ben Foden separating the two sides. "It was a good win. We really had to fight and graft," said coach Martin Johnson. "I quite enjoy that type of game - it's not always pretty, but that's test match rugby. Last year we lost to Ireland in a similar sort of game and it rips your guts out." Jonny Wilkinson, second choice flyhalf these days, came on after 51 minutes - following an injury to Toby Flood – and showed the kind of temperament and ability you’d expect. He slotted a long range kick within seconds of entering the stage, and later controlled things nicely, with a few well timed offloads in what was a good opportunity for him. While Johnson has said that it’s too early to talk of the Grand Slam, England are on the right track and if they manage to pick up their overall error count, will be difficult to stop. You can watch extended highlights of the game on the Eplayer on the sidebar. Navigate to 'Rugby Union' and there's a 9 minute long version there, as well as some of the other games. Italy gave Wales somewhat of a Six Nations scare in Rome yesterday, but the visitors were able to subdue them enough and show their experience to take a 24-16 win at the Stadio Flaminio. Wales scored in the first half through Morgan Stoddart, as well as scoring a great try that was finished off by flanker Sam Warburton after a nice Shane Williams run. Stephen Jones was back at flyhalf, kicking 11 points while James Hook was in the center, but managed to slot a late drop-goal. Gonzalo Canale and captain Sergio Parisse both scored for Italy, but four missed attempts at goal proved costly as they struggled to stay in touch. Wales coach Warren Gatland insists that his side still have a chance of winning the championship. "It still puts us in contention for the championship, we've got a big game against Ireland at home and then France," said Gatland. "It's a tough competition and it's about building momentum and confidence. We've had two tough wins away in the last two games and next we're at the Millennium Stadium at home and we want to get a result from our next performance. "Today's was a lot tougher (than Scotland). Italy are a very big, physical side. Perhaps because of the criticism of Italy in their first two games, playing set-pieces, scrums, line-outs, they played a lot more ball in hand," he added. You can watch extended highlights of the game on the Eplayer on the sidebar. Navigate to 'Rugby Union' and there's an 8 minute long version there, as well as some other highlights. The Melbourne Rebels shocked the Brumbies on Friday night at AAMI Park with a last gasp 25-24 win thanks to the boot of Danny Cipriani, and a try earlier on by captain Stirling Mortlock. A week ago the Rebels were the laughing stock of the competition, going down to a heavy 43-0 defeat by the Waratahs, raising questions about their inclusion and the overall expansion of the Super 14 to Super Rugby. 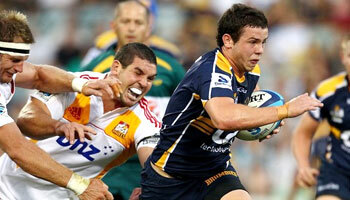 They’ve proved the critics wrong though with a gutsy performance that included 124 tackles to the 33 of the Brumbies. "Our scramble defence was incredible," said Welshman Gareth Delve. "We knew that if we stayed in it, we could score points. Everybody stepped up. We've got a lot of quality in our team. We believed in ourselves." Former England flyhalf Danny Cipriani kicked 20 points with his six from seven kicks, including the late penalty that won the game for the home side after a controversial call by referee Jonathan Kaplan, who had earlier missed what looked like a forward pass for the Brumbies try. For Stirling Mortlock however, scoring the first ever Melbourne Rebels try against his former side the Brumbies must have been quite special. You couldn’t have scripted it better, and with the late winning kick, the city of Melbourne are now warming to their new side nicely. The Rebels are away next week though, heading to Hamilton to face the Waikato Chiefs. England face France later today in a Six Nations clash that would be considered by many to be the biggest game of the weekend. We were fortunate enough to catch up with Shontayne Hape and Tom Wood earlier in the week for a chat. Hape, the former Bradford Bulls and New Zealand Rugby League player, is now a full fledged England player, having been in the country for long enough to call it home. He has recently signed for London Irish from Bath, where he switched to Rugby Union in 2008. In this video he answers some of the questions you posed to him on the RD Facebook page, as well as a few others that we thought might be of interest. As a bonus we were able to chat with up and coming young flanker Tom Wood, who had an excellent debut against Wales a few weeks back. Powerfully built and able to slot in the back or second row, Wood will provide England with line out options as well. He'll start today and in this interesting chat he spoke about what it's like to blend in while in camp, what he thinks about coaches winding up players, and what he most looks forward to come kick off on match day. Thanks to Nick Heath for the great interviews, and Lloyd Morgan for the video production. Earlier today you got to see some of the better tries from last weekend's opening Super Rugby weekend in Rugbydump's Pick of the Week. Right now, lets catch up with another popular feature, Fox Sports' Plays of the Week. There's been a few requests for it already, so even though there's a few things repeated in this edition (that you've seen here already on RD this week), there's one or two bits that are worth watching for, and no, I'm not referring to the bits that are shown in the pic. There were a few shockers in terms of bloopers in round 1, with the worst probably going to Will Chambers of the Reds, who was actually safely over the line when he failed to catch the ball. It's a bit harsh to make that a Friday Funny, so showing it as part of this segment works well. Blame the Rugby Club. The Chiefs also fluffed a few, although the mention of 'Percys' seems to have passed over in Australia. Maybe after Chambers we need to now call them 'Willys'? Great tries, some cracking hits, and a few funny moments, they all come together nicely in this week's Plays of the Week from The Rugby Club. Enjoy the weekend and make sure you follow Rugbydump on Twitter and Facebook for the latest updates, inside info, and a whole lot more. Also if you're watching matches this weekend and spot anything you think could be featured here on the site, feel free to grab a pen and paper to make a note of the time of the incident. Then fire in an email or request and Rugbydump will take over from there. Cheers! It's the end of the week so a busy few days of watching rugby are upon us. The big Test everyone is talking about is the England vs France game in the Six Nations. 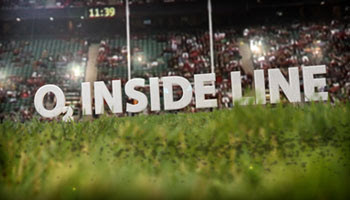 On this week's O2 Inside Line, we catch up with the England camp. It's not only a match between two in-form sides, but one of the biggest rivalries in Championship rugby as England and France have somewhat of a history. French coach Marc Lievremont also gone out his way to stir things up with some trash talk, specifically of his hatred for England. The England side are pretty laid back and relaxed though, enjoying their time at Pennyhill Park while they prepare for the big game ahead. This week Austin Healey takes a visit to the impressive Tindall residence to get some of his thoughts. Tomorrow we've got an exclusive interview with former Rugby League international and current England centre, Shontayne Hape. As a bonus, Tom Wood also sat down for a chat. It was a bit of a mixed bag in round 1 of Super Rugby last weekend, as we saw a few relatively dull games, as well as some that were thoroughly enjoyable to watch. Here's your Pick of the Week, featuring the best tries from the first round. As mentioned in a previous post, the Blues match against the Crusaders was probably the game of the weekend in terms of a spectacle, with the result, a narrow win for the Blues, possibly being somewhat of an upset. This weekend the Crusaders were set to play the Hurricanes, but due to the devastating nature of the disaster that's taken place in Christchurch, both franchises have agreed to not play the match, with the result being considered a draw. Each side will take two points from it. You saw Robbie Coleman's brilliant effort for the Brumbies against the Chiefs, as well as Gerhard van den Heevers solo sprint against the Lions, earlier in the week. Those are included again in this summary, along with a pick of the best from the other matches. On a side note, there's been a few distasteful comments on here of late, which is totally against the spirit of the website and cannot be considered acceptable. Rugbydump has always strived to bring you the best video clips from around the world, aiming to make it a pleasant experience for the true rugby fan, no matter where you're from. You're exposed to literally thousands of people from all over the world every day of the week. Embrace that, discuss rugby, make friends. If you can't do that, please don't bother commenting. Arguing on here is pointless and all that happens is the site's reputation gets tarnished, which leads to less traffic, less revenue, and less chance of RD staying afloat. Please be a positive part of this community, and enjoy the free service that's provided. Thanks. One of the matches of the weekend was without a doubt the Super Rugby game between the Blues and the Crusaders in Auckland, which the home side won 24-22. It was fast paced ambitious rugby, with plenty of physicality, most of which has been packed into this short compilations for you to enjoy. It was built up to be the match up of the weekend, and fans weren't let down as those at the stadium, a healthy 32 000 plus, and those at home watched a thrilling contest between the two New Zealand heavyweights. Goal kicking wasn't great, but aside from that the match had everything, with a few stand out players making powerful charges, tackle breaking runs, and of course big hits. This short video features some of the rough stuff from the game, with guys like Rene Ranger of the Blues brushing off tackles but also taking a few big ones. Jerome Kaino was also sensational, tackling everything that moved and showing why he's rated so highly. Some of the notable hits could easily be featured here as stand alone clips, namely Isaia Toeava's big tackle early in the game, Corey Flynn's on Ranger, and Anthony Boric's huge tackle on Israel Dagg. There's one of two bumps and charges that are worth seeing too, so it's all included. Tries from this game will be featured in another compilation sometime this week if all goes well. For now, hopefully this gives you an idea of the level of physicality of this particular match-up. Another contender for Super Rugby try of the weekend was this individual effort from 21 year old gas-man Gerhard van den Heever of the Bulls. 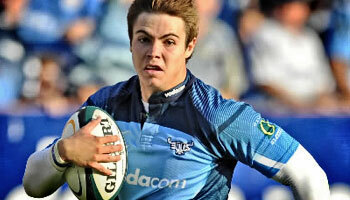 They beat the Lions 24-20 in what was a closely contested affair at Ellis Park on Saturday night. The Lions, who now have wealthy investors and subsequently a few new signings, put in a strong second half performance but couldn’t quite manage to get through the defending champion Bulls, who had a healthy dose of Springboks in their ranks. It was uncapped youngster Van Den Heever though who scored the try of the game, this great individual sprint effort from 60m out after a poorly chased kick ahead by Elton Jantjies. The talented wing spotted a gap and went for it, burning up the turf while gliding through hapless Lions defenders, who will know too well in future that you can’t give a guy of his ability so much space. We saw that last year against the Highlanders. "Every Bulls try is special. One is not worth more than the other to me, as they all contribute to the team effort," Van den Heever said later. "It is nice to start the season like this, but it is my job to score tries, after all. We talked before the match about the chip kicks from Elton (Jantjies) and I was ready for that. When I started to run, the gaps kept opening up so I just kept going," he added. Young Robbie Coleman scored one of the tries of the weekend as the Brumbies got their Super Rugby campaign off to a positive start with a 28-20 victory over the Chiefs in Canberra on Saturday. Coleman, the 20 year old Australian Sevens star, cut through the defence then stepped veteran All Black fullback Mils Muliaina with ease as he finished off a great try that started with a turnover from a huge Julian Salvi tackle earlier. In fact there were a few big tackles before the try came about, including one from Fritz Lee that rocked Pat McCabe as he got ball and all. He did well to retain possession though, which led to Coleman sniping through a few forwards then stepping the last man. It was his debut start for the Brumbies and despite weighing just 83kg’s and opposing Tana Umaga, Coleman managed to make an explosive impact. Coach Andy Friend wasn't too surprised, says he’s always been impressed by the young flyer. "Robbie's got real speed," Friend said. "He's got similar footwork and vision to Matt Giteau. That combination worked well. They pose a real threat. "Every time Robbie has been asked to step up to another level, whether it's the Australian under-20s or the sevens, he has done it, which is the sign of a quality footballer." Coleman looks to be yet another talented young Australian back that will no doubt terrorise defences for many years to come. He'll be one to keep an eye on this season. Leicester Tigers beat Wasps 21-12 at Welford Road on Saturday night, with Jeremy Staunton and Steve Mafi scoring two first half tries which put them well ahead. Shortly before the end of the game, Alesana Tuilagi hammered the nail in. Wasps could only muster four penalty kicks, from Dave Walder, while it was the Tigers who looked to play more of the rugby in what was a muddy game played in conditions that weren’t conducive to expansive play. Tigers extended their lead at the top of the Aviva Premiership with the win, and despite Wasps being excellent on defence, they couldn’t create anything that would crack the opposition line. "Sport can be tough sometimes," said Shaun Edwards. "I feel we deserved a bonus point out of that game, with the effort of the players out there. Our defence was superb in the 22." Coach Richard Cokerill of Leicester said that Wasps were negative all round. "It was almost rugby union versus rugby league at some stages. We scored two tries to zip against a team that didn't really come to play," he said, although he did concede that they ‘D’d up well’. 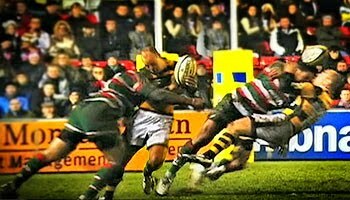 The Tigers ‘D’ was pretty good too, with wing Alesana Tuilagi coming in and smashing Wasps fullback Mark Van Gisbergen shortly before full time, showing that even with game time almost up, you can never be too careful when the Tuilagi brothers are around. You can view quick highlights from this match, as well as others in the Aviva Premiership, on the sidebar E-player to the right of this post. Another busy weekend has come to an end so while we try to bring you the best clips from around the world of rugby, here’s a start with short highlights from the Melbourne Rebels’ first ever game in Super Rugby, a heavy 43-0 loss to the New South Wales Waratahs. In their first season, the Melbourne Rebels were given a harsh wake up call as the scratch side will now realise what they’re up against. While they started well early on, things soon went downhill as the Waratahs, who by all accounts look the strongest Australian team, showed their class with top performances from their Wallabies. The likes of Kurtley Beale, Drew Mitchell, and Berrick Barnes were simply too much for the tournament newcomers, who had former England flyhalf Danny Cirpriani make an early appearance off the bench that was forced through injury. Starting flyhalf James Hildendorf is out for six weeks with a shoulder injury, center Cooper Vuna injured his shoulder, while flanker Hoani Macdonald broke bones in his hand. Despite the seven try drubbing, coach Rod Macqueen has tried to remain positive after seeing some signs during the game that he can work with in the next few weeks. "I've got a fair bit of faith in a lot of the good things they did there to say that we will be competitive this year," he said. "You can't go away from the fact you're going to be judged on the scoreboard. But as coaches we can see some light at the end of the tunnel there." Please note that Rugbydump is not a paid for highlights channel, so every match will not be shown. Where possible though, certain games will be featured, but the focus will always be to bring you the best incidents and moments from around the rugby world. Super Rugby kicked off earlier today with the Highlanders beating the Hurricanes 14-9 in a scrappy affair in Wellington. 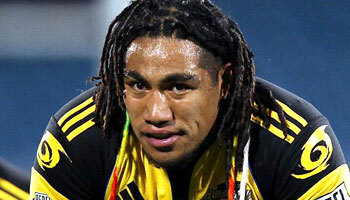 The home side played most of the second half with fourteen men after Ma'a Nonu was sent off with a second yellow card. The opening game of the tournament started with less action than was expected, with the halftime score sitting at a fairly evenly poised 11-6 to the Highlanders after a try and two penalties were scored by Lima Sopoaga on debut. Ma'a Nonu of the Hurricanes was sent to the sin bin after 30 minutes when Stuart Dickinson ran out of patience and yellow carded the All Black for killing the ball at the breakdown. Ten minutes off, then ten minutes on, Nonu seemed to get up to charge down a kick, pulled out, and lent in with the shoulder on Highlanders halfback Jimmy Cowan, who fell to the floor and milked it for all it's worth. Confirmation of that was when Cowan later popped up with a huge smile on his face, to the point of laughing at the booing in the crowd when seeing himself on the big screen. Earlier in the week we had a look at Jonny Wilkinson's try saving hit in the Six Nations. This was another stand out from the weekend, as Sean Lamont of Scotland had a blinder against Wales. In what was a poor game of rugby for the viewer at home, Lamont came on for Scotland when Hugo Southwell went off with that nasty knock to his face from the boot of Lee Byrne. While Scotland struggled to get their game together - at one stage unable to score a try against Wales' thirteen men - Lamont showed his commitment with determined runs and this great try saving tackle on Jamie Roberts. He has since called for his team mates to shape up or ship out. "It was abysmal -- the boys need to go away and have a look at themselves," said Lamont. "I'm sick of having this year after year, valiant losers or whatever. We need to pull our fingers out, there's been too many years gone by where we've been also-rans. It's not good enough." 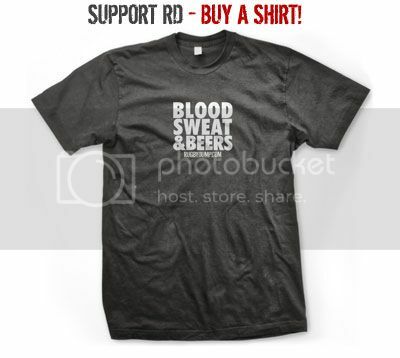 Are you ready for Super Rugby 2011? As you will realise, Super Rugby kicks off tomorrow in New Zealand with the first game of the tournament featuring the Hurricanes and the Highlanders. This year the tournament is expanded to 15, and has a slightly different format to before. This video, fairly similar to one that was posted a few months back, talks you through how the tournament came to be, from its humble beginnings as the Super 10 some time back. Since then we’ve seen it change its face many times. Super 10, Super 12, Super 14, and now Super Rugby, the thing that hasn’t changed is the standard of play, entertainment value, and quality on show. It’s something every true rugby fan should be part of. While the tournament has had its critics, mainly coming from up North, it comprises the top three in world rugby and has been the pace setter for many years now. There are obviously a few reasons for that, weather conditions being one, but attitude, ingenuity, and depth of talent are another. Comparisons to Heineken Cup rugby have always existed, but there’s absolutely no reason why you can’t enjoy both, as they each bring something unique to the table. There’s also a new side this year, the Melbourne Rebels, which should make things interesting, especially as there’s a former England star flyhalf playing for them in the form of Danny Cipriani, amongst other former Test players. You can download the official fixture list (.pdf) via the website here. The following is an interactive, clickable video, using the same technology as the James O'Connor video we posted last year. You can mouse over and click when prompted for more info, or just move your mouse off and watch it like normal. The South African Sevens team beat Fiji 24-14 in the Cup Final of the Las Vegas Sevens, with their speed and agility too much to handle for the bigger Fijians. This video features highlights of the top teams in action, as well as the final. New Zealand and England had been considered favourites for the tournament but were knocked out by Fiji and South Africa respectively. 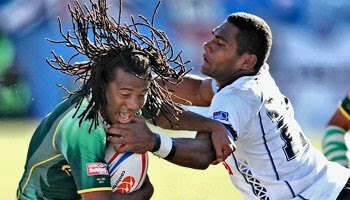 Last years winners, Samoa, were beaten at the quarter final stage by rivals Fiji. Cecil Afrika was key for the South Africans in the final, helping them get to 19-0 up in just six minutes. Fiji fought back to make it 19-14, but another try to Bernardo Botha 3 minutes from time took the game away from them for a memorable South African win. "I think it's awesome, and especially for a young player like Paul Jordaan, to come on board and win a tournament on his first tour, those are the kind of memories that we would like to build," said Blitzbokke coach Paul Treu. "For all the youngsters back at home, hopefully it's going to be an inspiration to them, that anything is possible. They just have to keep working harder and give themselves a chance." Halfway through the series, England are still tied with New Zealand at the top of the table, followed by Fiji and Samoa (also tied), and then South Africa in fifth position. The HSBC Sevens World Series moves to Hong Kong next, on March 25-17. Jonny Wilkinson is playing second fiddle to Toby Flood these days, but despite not being the key figure he used to be, he’s adjusting to the role well and contributing where he can, as was seen on Saturday during England’s whitewash win over Italy. Flood has come into his own at flyhalf, showing some of the form of his career, including a Man of the Match performance in the win over Wales. For Wilkinson, that means he’s playing the backup role, which can be slightly frustrating at times, as he said recently. "It is hell sat on the sideline but at the same time it is massively important. 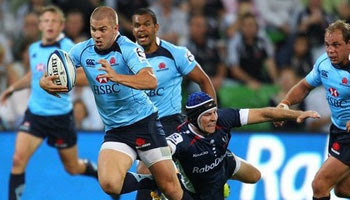 Being on the bench brings new lessons for me," Wilkinson said. "My desire to play for England is still as great as it was when I won my first cap. I am now in a role where I contribute slightly differently." While not starting, he is playing some top quality rugby and still has the ability to come on and do the business when needed. 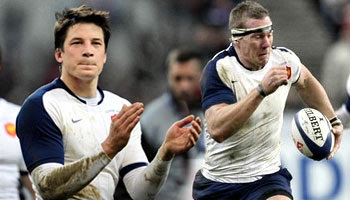 It’s a great position for England to be in, and injuries aside, Wilkinson will play in his fourth World Cup this year. "To play and play and play is crucial for me. It's been a while and there were all kinds of different injuries going on. Seven years of coming in for cameo appearances has thrown me around in a way I don't think I'll ever understand fully. "Your confidence goes with all these things. It has been an interesting journey for me. I've learned that if I want to play rugby I can only play it one way or I don't play it at all. My desire is to keep trying to get better and better. It would mean a huge amount to me to play in a fourth World Cup. I'm in it for the long run and I will give it all I've got and nothing less," he added. As can be seen in this clip, Wilkinson came on against Italy and showed his commitment to the cause with a sensational try saving tackle late in the game that prevented Andrea Masi from diving in at the corner. It’s been one of the most requested clips this week, so here you go. Rupeni Caucau scored his first try for Toulouse on the weekend as they snatched a narrow 22-19 victory over La Rochelle at the Stade Marcel Deflandre. There was a glimpse of what we remember from the dynamic winger, so things are looking up. The goal for Caucau, and all Fijian and in fact neutral fans, would be to have him fit, on form, and turning out for his country at the World Cup in New Zealand later this year. His move to table topping Toulouse was probably the best thing for him as he’s managed to shed some of his bulk and by all accounts seems to be playing some decent rugby, with this try in particular proving vital in the tight Top 14 game on the weekend. His slick handling set up a nice run from fellow Fijian Vilimoni Delasau, who returned the favour for Caucan to dash away, beating a few hapless La Rochelle backs. He also made a nice tackle earlier in the game, showing he’s adept at second centre as he kept an eye on his man, fullback Greg Goosen, all the way, then squashed him into touch. The former Auckland Blues superstar, who scored 15 tries in 14 Super Rugby caps, was recently named as being in the top five of greatest ever Super Rugby players. "Rupeni Caucaunibuca became the competition's most feared winger," the website said. "Caucau's ball running almost defied belief. In full flight it appeared as though he was in second gear, yet chasing defenders still invariably ended up eating grass. The Fijian had the strength and power of a forward while also possessing blinding pace." It now remains to be seen if his comeback has been left far too late, or if he will in fact make it to the top to show off his considerable talents at the show piece of world rugby. Last week the All Blacks came out with their Summer Edition tricks video to promote a competition on the Sky Sport NZ website whereby viewers should submit their own tricks video to win prizes. The Waratahs have since stepped up with this take on it. It didn't take them too long to put this one together, as the boys from Australia have once again taken the opportunity to take the mickey out of their New Zealand counterparts. It's all in good spirits though and as with the Brumbies having a go at the original All Blacks tricks at training video, the Tah's have made a pretty funny video that has already racked up a hefty amount of views online. You can still submit your own tricks videos by following the link on last week's post. For now, check this video out as we look forward to Super Rugby kicking off on Friday. Does your rugby club need a make-over? RBS RugbyForce is a community volunteer programme which helps local rugby clubs to improve their facilities. Register today and your club could be chosen to receive an enhanced support package that will do wonders for your club’s continued success. Rugby clubs across England, Ireland, Scotland and Wales can register to be part of the fun-filled RBS RugbyForce programme by signing up and submitting the reason why they think their club needs its facilities improved. Registered clubs are provided with on-line guidance and tools to help organise a community wide ‘make-over’ weekend. On 11 and 12 June 2011, as part of the RBS RugbyForce Weekend, your club could be receiving the support of the local community as you come together for a fun-filled few days of DIY, adding to the longevity of your club. The RBS RugbyForce Weekend enables clubs and the community to work together to make their club a better place for all. Last year over 400 clubs entered, and this year RBS is looking to reach even more clubs across the UK. One lucky club in each country will also receive a support pack worth £5,000, as well as a visit from a leading rugby player. Previous players to have visited winning clubs include Shane Williams and Chris Paterson. For your club to be in with a chance of receiving the enhanced support package, you need to outline the role your club plays in the local community and how your local community will benefit from the club's RBS RugbyForce renovations. Registration is open until Friday March 25, 2011, so with less than 6 weeks to go, register your club today. Find out more information and register your club at www.rbs.co.uk/rugbyforce. While the Scotland vs Wales game at Murrayfield was a rather dull affair, there were however one or two moments that are worth watching again. This is one that will surely spark debate, as Hugo Southwell’s reckless challenge went unpunished. It’s a tricky one to judge as Southwell took a boot to the face from his challenge on Wales fullback Lee Byrne, resulting in a nasty looking gash and a premature exit from the game. While the challenge was dangerous, he was not yellow carded, with referee George Clancy perhaps sympathising with the fact that the injury was punishment enough. Two years ago an almost identical incident occurred in the same fixture when Geoff Cross was up against the same player, fullback Byrne. He too came off second best, knocking himself unconscious in the process. Referee Alain Rolland issued the card nevertheless, despite him being driven off on a stretcher. While in many ways on this occasion Southwell did receive some form of punishment, is there still room for refs to make those type of emotional calls Perhaps it was admirable, but it looked incorrect as Byrne could have horribly. By all means if his boot wasn’t out, he might have. Which brings up another question to ponder – should players, most often fullbacks under the high ball, be allowed to lead with their boot so far out in that fashion? It is one of the ‘perks’ of the job, or should the technique be looked at and possibly outlawed? Whatever the case, it was a nasty incident that resulted in Southwell receiving stitches for the self-inflicted facial lacerations. Opinions on this incident will vary, so please share yours. 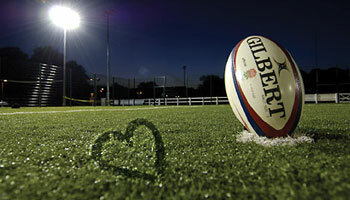 In case you've forgotten, today happens to be Valentines Day so to all those hardened rugby players out there, don't forget your loved ones and please, if they say they don't want anything this year, don't believe it. It's an old trick. I've fallen for it many times. As we get towards this evening, I'll probably find out I've been had again. So the safe bet is to get out there and make sure you take some initiative. If you're single, well then this day is for you as you'll be spending all your money on roses, chocolates, and whatever else you think will impress the object of your desires. This is a rugby website after all so lets swiftly get back on track and tie things in to the game again -are the men at the top of the most macho sport on earth romantic? Do they go out of their way to woo the ladies? There probably isn't a definitive answer on the topic. It is quite amusing to hear some of them talk about it though, as the responses were mixed when a few Aviva Premiership players were asked by Sky Sports and The Rugby Club recently. So did you drop the ball today, or stay focussed and bring out your A Game? 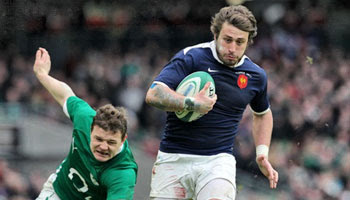 France beat Ireland 25-22 in Dublin yesterday in what was the defending champions' second straight win of the 2011 Six Nations championship. Poor discipline ultimately cost Ireland, who actually scored three tries to the one of the visiting French. Ireland went ahead through Fergus McFadden while Morgan Parra kicked the points on offer for the visitors. A late try in the first half to Tomos O’Leary meant that Ireland went into the halftime break 15-12 up. Parra and Dimitri Yachvili gave France the lead though, before Maxime Medard took them to 25-15 with his try, only to have Ireland come back into it with a Jamie Heaslip try after a sustained period of pressure. Ronan O’Gara dutifully slotted the conversion. As the clock ticked down with only a three point margin, France did what they could to run it down but slipped up and spilt the ball, giving Ireland one last chance, which they failed to take advantage of. "We had a chance with three minutes to go. We were 10 yards from their line, they were scrambling but we coughed up another ball,” said Ireland captain Brian O’Driscoll. "I thought we were going to do to them what they did to us at Croke Park four years ago when they won in the last minute, but again we coughed up the ball too easily. "The chance was there for us to take it but we didn't. That's a bitter enough pill to swallow. We felt like we had massive capability to score tries. The chances were there but we weren't clinical and that's what's killing us." French coach Marc Lievremont was pleased with his team’s ability to stay in the game despite conceding well worked tries. 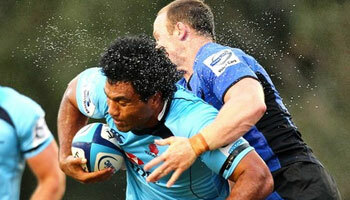 "They managed to score tries and put us under pressure over 80 minutes. With more patience we'll learn to find solutions to these problems. "I liked the way we bounced back. It could have been a totally disastrous match but we fought our way back. Ireland could have won but overall we played well," he said. If there are any incidents from the game that you think should be featured on here over the next week, please post a comment, a request, or send in an email with the details. Wales finally broke their eight-match losing streak with a hard-fought 24-6 RBS 6 Nations victory over Scotland at Murrayfield this weekend. Wales, who had not won an Test match since March 2010, ran out victors in a scrappy game that was littered with handling errors and penalties. They got the dream start when fly-half James Hook punctured the Scottish defence and off-loaded to the supporting Shane Williams for a converted score. Perpignan-bound Hook then slotted three more penalties to give Wales a 0-16 advantage over the home side. Dan Parks got Scotland’s first points with a penalty, although several try-scoring opportunities went begging: Joe Ansbro knocked-on when Wales were reduced to 13 men following yellow cards to Bradley Davies and Lee Byrne, and then John Barclay failed to hold-on to the ball near the whitewash. The sides remained dead-locked for large portions of the match, as the Scots couldn’t find a cutting edge to penetrate an impressive Welsh defensive effort. Sean Lamont was the standout player for the Scots, whilst Jamie Roberts looked to have regained some of the rampaging form that made him the 2010 Lions player-of-the-tour. The game was eventually sealed when Williams touched down for his second score, chasing a Jonathan Davies kick, which put the win beyond the reach of a stuttering Scottish side. Following the game, Welsh Captain Matthew Rees said: "We've been a wounded animal all week after the England game and we knew it wasn't an easy task coming up here to get a result. "The commitment, the endeavour, everything was there for us, especially going down to 13 men at one point. Discipline was a bit of an issue, but to come away with a 24-6 win was a great result for us." A fuming Scotland head coach Andy Robinson said: "We made too many errors particularly in that first 20 minutes. That is unacceptable, what happened today. We've gone back a couple of steps." If you fancy a game with a bit more excitement, have a look back at last year's fixture between the two sides, which was packed with action from start to finish. View that here. Swan-diving sensation Chris Ashton stole the show this weekend, becoming the first ever English player to score four tries in a Six Nations match and helping England crush Italy by 59 points to 13. It was an impressive display from Martin Johnson’s men and the win brings England another step closer to a Grand Slam. Red Rose fans will take a lot of encouragement from the confident and convincing performances from half-backs Toby Flood and Ben Youngs, whilst James Haskell was destructive in the loose. Italy, on the other hand, looked a shadow of the side that ran Ireland to the wire last week, with weak tackling and poor discipline costing the Azzurri dearly. Ashton’s first score came two minutes into the game as Flood ghosted through a large gap, before fixing the last-man and feeding Ashton for a type of score that is becoming a familiar routine for gleeful England fans. Mirco Bergamasco kicked two penalties for the visitors, but the feisty Italians were unable to prevent further scores from Ashton, Mike Tindall, and winger Mark Cueto. Fabio Ongaro claimed a consolation score for the visitors, but tries from Danny Care, the explosive Haskell, and two more for Ashton convincingly sealed Johnson’s Italian job. Italian coach Nick Mallet said: "Our line-out didn't function at all. It was a very poor day at the office for Italy. The massive difference between the two teams was the speed, the speed of Ashton, Cueto, Care and Youngs. "England played well but a lot of them were off Italian mistakes, they were helped by some poor defence by my players," he added. When asked about why he continues to celebrate with a flamboyant dive, Ashton said: "I knew [Johnson] would be a bit annoyed - the lads said he would be - so I thought I'd do it." It's Saturday and in a few hours time the second round of the Six Nations will get under way with England against Italy, then later on we've got Scotland hosting Wales. 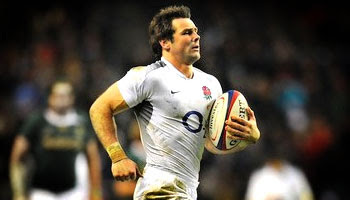 During the week we caught up with Ben Foden ahead of round two. Two weeks ago you were asked on the Rugbydump Facebook Page to pose a few questions to both Foden and Simon Shaw. Last week the Shaw interview was posted, so today we've got the chat with fullback Foden. Some of your questions were asked, including finding out why he's not on Twitter (turns out he is, with an under-skash), who's the most annoying person in the squad, and which backline he rates best out of the other Six Nations sides. Keep an eye out for similar interview opportunities and make sure you get yours questions in. Last weekend we saw Jon Davies trip Chris Ashton in the Six Nations opener. Accidental or not, there were subsequently a few trips down memory lane in the comments, with this incident from the 2003 World Cup coming up. It was England against France at Stadium Australia, a game that England won 24-7 to head into the final to face the home side. Jonny Wilkinson guided them there with a top quality 24 points of his own, including 5 penalties and 3 drop goals. It obviously good preparation for what followed. While France managed to score the only try of the game, the weather on the day wasn't great and definitely not conducive to running rugby. In the first half when England did have a decent chance, releasing the dangerous Jason Robinson out wide, it was chopped down instantly. Christophe Dominici, France's lethal try scorer in the '99 World Cup, stuck a leg out to stop Robinson as he danced his way around him and found a little bit of space. The French wing was yellow carded for the offence, proving somewhat of a turning point in the game. To add insult to injury, he never returned from the sin bin, as he'd done his leg in the process. It's time to catch up with the O2 Inside Line show again, as this week Danny Care gets behind the camera to take you behind the scenes in the England camp ahead of their game with Italy. There's also a cook-off between Toby Flood and Dan Cole. After a strong performance by Italy against Ireland last weekend, this weekend's game at Twickenham could prove to be a decent test for the home side, who picked up a good win over Wales in the opening game. There's a few tweaks that need to take place to make England a far stronger side though, and if they get that right, Italy and Sergio Parisse may just find themselves up against a challenge that they're simply not equipped to handle. It should be fascinating nonetheless as Italy, the perennial underdogs, seem to be building nicely and have shown that they can mix it up with the best of them on their day. England will be more than aware of that, and preparations this week will have been no laughing matter. That said, in this video we go behind the scenes and see some of the stuff they get up to in their off time. There's a cook-off for Austin Healey, some heads comparisons, and a prop with a tan. They've done it again. The All Blacks and SKY Television have teamed up once again to bring us another brilliant All Blacks Skills video. This time they're in the backyard, you now have the chance to submit your own skills video, and win big. In September last year we first saw them do their thing with a video that became a massive viral hit, with over 2 millions views on Youtube in just a few months. Then it was Cory Jane, Piri Weepu, and Rene Ranger at training, this time we've got Jane again, who is joined by Ma'a Nonu and Israel Dagg. They impress once again with their perfectly placed kicks, pinpoint passing accuracy, and superhuman, eyes in the back of the head vision. It makes for great viewing, and in a Rugby World Cup year where New Zealand are the hosts, it's a brilliant way to keep the hype going. You've can submit your own rugby skills video by visiting skysport.co.nz/skills. The Grand Prize for the comp is a trip to Eden Park for an All Blacks game with five of their mates for a VIP experience like none other, including meeting some of the team. There's plenty of other prizes too, and the winners will actually be chosen by the players themselves, with the results of the competition being announced in May this year. So enjoy the video, and if you fancy entering, sign up and submit your own skills clips. Here's a quick clip of what happened straight from the kickoff in last Friday's RBS 6 Nations opener between Wales and England at the Millennium Stadium. As we know, England won the game 26-19. You can view highlights here. Foden took a bit of stick after his comments about Wales ahead of the game, but to his credit, he backed up his words with another impressive performance, once again showing that for a relatively small guy, he's got serious upper body strength. We saw in in the autumn too, where because of his willingness to run the ball from anywhere, he's developed a great offloading game and has become good and retaining possession when taking it into contact. We've actually got interview time with him later today, so we'll have an interview up on the site on Saturday probably, and hopefully have a few comments from him about this collision, where Stephen Jones came out of nowhere to smash him but got the worse of the two. In fact Jones didn't look right for some time after that, showing signs that despite being helluva tough, he was perhaps more affected than he let on. For Wales' game this weekend, James Hook has been brought in at number ten, which will no doubt improve their backline formations and attacking threats, which was a major problem against England. Foden says that England are now a team in form, that others must look to and realise that they're a serious contender for the title. "I think people will have taken notice of that (win). Wales are a good side and to go down there and beat them on their own turf is a good achievement," he said. Some of you wanted to see this incident again, so here you go. Do you think Jones' technique was poor, Foden's strength did the damage, or it was just one of those freak occurrences? You saw the highlights of the final of the fantastic Wellington Sevens yesterday, so here’s another clip from the tournament, this time of a huge hit that unfortunately ended in a red card for Fiji’s Seremaia Burotu. Fiji and Samoa met in the Cup quarter final, with Samoa coming out 12-5 eventual winners, helped in some respects by the sending off of Burotu, their leading try scorer. The hit on Afa Aiono, who had actually scored both of Samoa’s first half tries, went wrong after initially being a good, solid tackle. The lifting and tipping motion ended things for him though, with referee Stuart Berry having little option but to red card the Fijian vice captain. He missed the subsequent plate semifinal and final, and picked up a three match suspension when later sitting through a disciplinary hearing. That was reduced to two after an appeal, and the fact that he’s missed the two games already means that he’s free to appear at this weekend’s Las Vegas Sevens, the USA leg of the World Series. "The 7s team management sat with the International Rugby Board Judicial where he was dished a two-match ban. 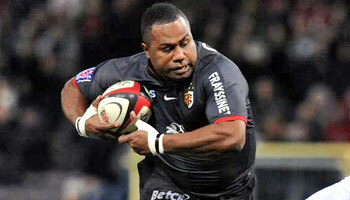 This, he has already served so he should be able to play this weekend," said Fijian staff member Talemo Waqa. Unfortunately this type of hit is dangerous and while initially it was an impressive show of timing, technique, and strength, you just can't get away with that these days. After a great opening weekend of Six Nations rugby, it seems as though there were a few key incidents or moments in the games that grabbed most of the plaudits and attention. This is one of them. You will have seen the highlights of the France vs Scotland game here on RD earlier in the week, so by now have probably already seen this try but I thought it would be nice to post it on it's own for those of you who fancy seeing the neat bit of skill again. Francois Trinh-Duc was brought back into the French side as flyhalf after Damien Traille was fairly unsuccessful there during the Autumn Internationals. It seems as though it was a good move by coach Marc Lievremont, as the 24 year old got his backline going nicely all match, including this outrageous flick pass that resulted in a try. It was no doubt just a 50-50 pass that came instinctively, but it worked perfectly and number eight Imanol Harinordoquy was the worthy beneficiary of the flick pass, finishing well before bringing a smile to the face of young Trinh-Duc, who was probably as surprised as everyone. The last time we saw a scoring pass from a flick through the legs must have been that try Joe Rokocoko scored against the Springboks in 2003. On that occasion it was the man you'd most expect it from, Carlos Spencer. This time, it's Trinh-Duc who has been added to the archives. New Zealand won their second IRB World Series Sevens tournament in succession as they won at home, beating England 29-14 to take the Wellington Sevens title this past weekend. Debutant Declan O’Donnell proved to be the star of the final. Still only 20 and very much unknown before the tournament commenced, O’Donnell has burst onto the scene with his highly impressive performances over the weekend, scoring ten tries in total, and a hat-trick in his first ever final. "He's outstanding. He had an outstanding tournament," said New Zealand coach Gordon Tietjens. "It's a huge call, I know, but Declan's got some traits of Christian Cullen - fast feet, ability to glide and step at pace - and one-on-one you just know he's going to beat the guy. "The more I see of him, he's got a bit of Frank Bunce in him as well. I see him as a true centre, a potentially great centre, unbelievably strong defensively and a bit of mongrel thrown into the mix," he added. England scored early but New Zealand hung in and soon turned things around as they streaked away victors in front of a capacity crowd at one of the most festive events on the Sevens Series calendar. They are now level with England on 64 points on the table. The series now moves to the US, and Las Vegas, on Feb 12th. Keep a lookout for O’Donnell in the near future. He’s tipped to do big things, and with so little experience and game time behind him, is already a top try scorer. One to watch.